Many of the stoves we fit in Oxford and the surrounding areas are installed into existing fireplaces, but if you don’t have a fireplace don’t worry, you can still have a stove in your home. As specialists in stoves and chimney specifications, we can tell you what your options are with regards to fitting a stove in your fireplace. Many fireplaces have a much larger ‘builder’s opening’ where your stove can be installed. Preparing this area is part of the comprehensive installation service we can provide. 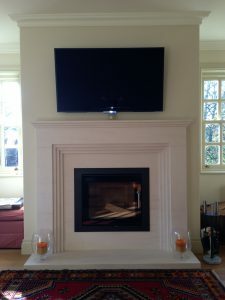 We can supply and fit hearths for your stove, and if you want to you can use an existing surround, or as many people choose to do, leave the opening plain. It is important to note that wooden fixtures may not be suitable within the vicinity of the stove, and this can include timber fire surrounds, lintels and beams. This is because stoves produce much more heat in their immediate area than an open fire – which will actually have a cooling effect on these materials due to the enormous influx of air an open fire needs. We can supply and fit hearths that are made to measure and available in a range of materials including, slate, stone, granite or marble – a great choice of quality natural materials that will enhance the aesthetic of your home. There are many surrounds available that are safe to use with a stove – in iron or stone for example, and they can even be made to your own design. Even properties built without a chimney in Oxford and locally can benefit from one of our stoves. With some additional work to install a double walled chimney – the extent and cost of which can vary, depending on the exact requirements – you too can enjoy a wood burning or multifuel stove.